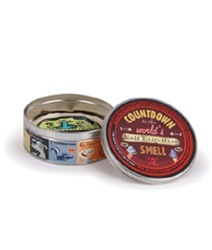 This fun display counts down the most rotten smells imaginable and then allows viewers to smell the worst, foulest, nastiest smell of all: tobacco smoke. Reminds viewers that the rancid smell of tobacco smoke (full of formaldehyde, benzene, and other poisonous chemicals) is absorbed into the hair, clothes, and skin of smokers. An excellent way to present one of the more repellent aspects of smoking without using real cigarettes. 7" diameter.